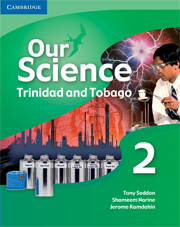 Our Science is an integrated science course written specifically for use in secondary schools in Trinidad and Tobago. 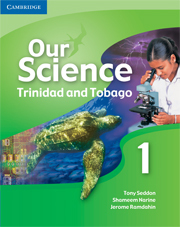 Beginning Science (What is Science?, What Scientists do, Working like a chemist, Carrying out an investigation, Presenting data and results in tables, Making pie charts,bar charts and line graphs, The main science skills, Using science skills, Tools scientists use, Measuring in one dimension, Measuring in two dimensions, measuring in three dimensions, Measurement units scientists use, Jumping is very scientific. Topic 1: Living matter - Cells and micro-organisms, Topic 2: Non-living matter - the particle nature of matter and some properties of matter, Topic 3: Energy - Heat.